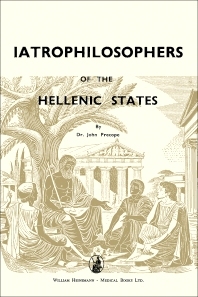 Iatrophilosophers of the Hellenic States distinguishes the iatrophilosophers from the manual practitioners and from the educated amateur or theoretical researcher. This book discusses the intrusion of philosophy into medicine, which was the first background of the scientific spirit amongst the Greeks. Organized into five parts encompassing 30 chapters, this book begins with an overview of several great priest-physicians or religious healers, including Linus, Orpheus, Musaeus, and Asclepius. This text then describes the great men that earned the title of "wise". Other chapters consider Thales, who gained the title "wise" in the time of the Athenian archon Damusius. This book discusses as well several men of a speculative turn of mind, known as dialecticians or sophists. The final chapter deals with Aristotle, the famous iatrophilospher who flourished during the time the Hellenic States had remained free or independent. This book is a valuable resource for readers whose interests span a variety of fields.